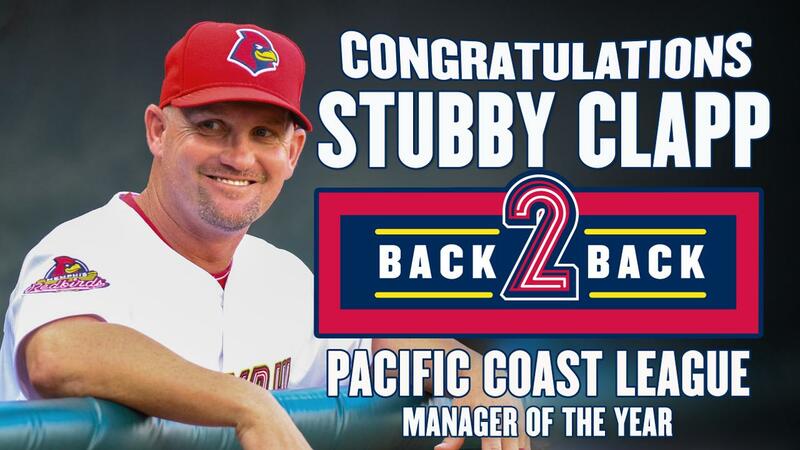 MEMPHIS, Tennessee - Memphis Redbirds second-year manager Stubby Clapp has been named the Pacific Coast League Manager of the Year for the second-consecutive season, the league office announced Tuesday. Clapp joins Tacoma's Dan Rohn (2004, 2005) and Phoenix's Jim Lefebvre (1985, 1986) as the only PCL managers on record to win the honor in consecutive seasons. In his second year at the helm of the Redbirds, Clapp has guided his team to its second-consecutive American Southern Division Championship, and one of the best records in franchise history, again. The Redbirds are 80-53 with seven games remaining this season after going 91-50 in 2017. After securing their 80th win of the season last night, Clapp led Memphis to the fourth 80-win season in franchise history. They went 83-61 in 2000 when Clapp played for the Redbirds, went 82-62 in 2010, and were 91-50 last season. In his two seasons as Redbirds manager, Clapp has guided the team to success amid constant roster moves. In his two years in Memphis, 95 different players have donned a Redbird uniform, with 30 of those players making their Triple-A debuts, and 15 of them being promoted from Memphis to make their Major League debuts. Memphis began the season 9-1 in the first 10 games, giving Clapp his 100th win as Memphis manager. He became the fastest to reach 100 wins in Redbirds' history and in the 116-year history of the PCL. With the team's 59th win of the season on July 15, Clapp became the fastest manager in Memphis history to win 150 games. He has a record of 171-103 with Memphis. His 171 wins rank fifth all-time in Redbirds' history, and his .624 winning percentage is the best mark in franchise history. With seven games remaining, this year's team is on pace for the best ERA in franchise history, bettering the mark they set last season. Last year they had a 3.77 ERA, and this season they own a 3.53 mark, best in the PCL. Since moving into a tie for first place in their division on April 28, 2017, the Redbirds have remained either tied for first or in sole possession of first place. They have been in first place for 487 consecutive calendar days, and have played 253 regular-season games in that span. Last season, Clapp led the team to its first PCL Championship since 2009. He has led them to consecutive division titles for the first time since 2009-2010. Clapp is the only manager in Memphis history to have won PCL Manager of the Year honors. Memphis will play the last seven games of the regular-season on the road, playing three at Round Rock and four at Nashville. The Redbirds will begin the playoffs on the road on Sept. 5 before coming home for game three on Sept. 7. Redbirds playoff tickets are on sale now and can be purchased at www.memphisredbirds.com/playoffs.